The Injury Prevention Branch endeavors to reduce death and disability from intentional and unintentional injury through coordination and implementation of health promotion and education programs and special events. Injury is the leading cause of death in Alabama for citizens ages 1-34 years of age. Injuries occur in highly predictable patterns with recognizable risk factors among identifiable populations. Injuries are a preventable health problem. They are not accidents. There are two types of injuries: unintentional and intentional. Injury and Violence in the U.S. 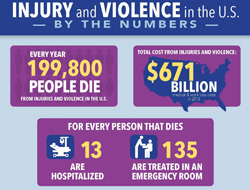 The CDC Injury Center released an infographic providing a snapshot of injury and violence in the United States and the scope of the problem in terms of morbidity, mortality and cost to society. Prevention strategies for a number of common causes of injuries are also examined. Visit the CDC to see the entire infographic. Statistics regarding all deaths due to injuries in Alabama from 2006-2011. In cases of a fire or when in need of an ambulance or the police, call 911 or your local emergency number. On March 28, 2005, the governor of Alabama put forth a proclamation titled "Injury in Alabama: A Focus on Prevention."